Art isn’t just for art geeks. Whether you are an artist, an art lover or a collector, here’s a guide to a gallery crawl in Kolkata. Pick up original works for your walls, or mark your calendar for an upcoming show. Experimenter is known for showcasing contemporary, experimental and alternative art from South Asia. The gallery represents artists like Bani Adibi, Adip Dutta, Sanchayan Ghosh and others. July is the month to look out for its much-awaited annual event, Curator’s Hub. Their next exhibition ‘Random Access’ by designer Kallol Datta will run from August 10 to August 31. One of the leading galleries of recent times, Akar Prakar is perfect if you are looking for modern art in all mediums — sculptures, installations, paintings, photographs etc,. Known for their constant collaborations with museums and institutions, Akar Prakar has numerous shows around the year. Their commissioned books and journals are something that art lovers must definitely check out. Myna Kakkar’s charming boutique gallery, Verandah Art Gallery, showcases both art and installations. Best known for curating emerging young artists from Bengal, Verandah endorses a wide range of art forms and curates artworks of artists like Subrata Das, Shipra Bhattacharya, Jagannath Paul and acclaimed photographers like Gary Solway, besides others. This one is a niche private gallery in Behala known to curate modern and contemporary art in all mediums. A great place to promote new young and upcoming artists, Janus also showcases its prized old masters collection. Gallery visits are only available on appointment. Known as a resource centre of diverse art forms, The Harrington Street Arts Centre (THSAC) specialises in curating contemporary art. Showcasing an incredible array of Indian and International artists, THSAC also offers several art appreciation courses and programmes. 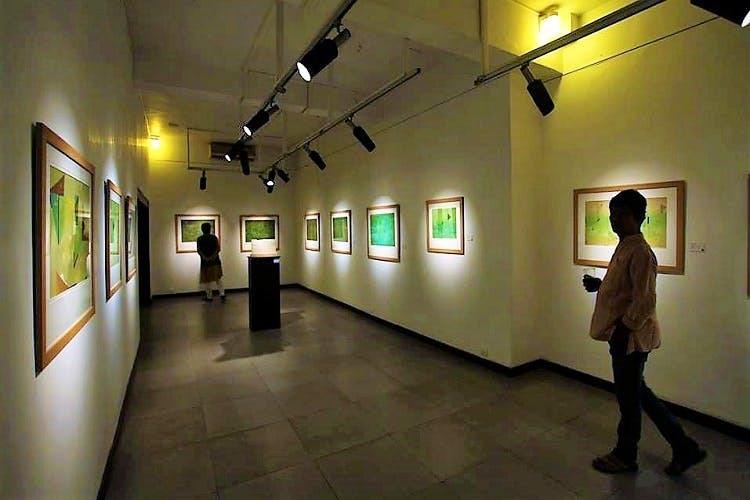 The araby of all art lovers in Kolkata, CIMA gallery is one of the premier art centres of India. An endorser of modern arts, CIMA organises several interdisciplinary shows and exhibitions in association with prestigious international museums and organisations. Watch out for CIMA’s annual Art Mela held every October where you can pick up works by well-known and upcoming artists for a steal! A curator of both international and Indian artists, Gallerie 88 is known for promoting modern and contemporary art. Its curated artists include stalwarts like MF Hussain, Ganesh Pyne, Paritosh Sen, SG Vasudev and others. Check out their ongoing exhibition Perspecta – 17 that goes on till September 27.